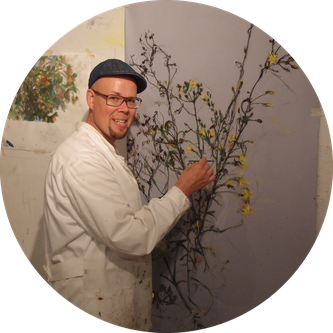 Tero Annanolli won a gold medal at the London Cultural Olympiad in 2012 and became a member of the Olympic Fine Arts Association (OFAA) in 2014. Annanolli typically chooses flowers, plants, landscapes and boats as themes for his paintings. In portraying humans, Annanolli approaches his subject in relation to the environment and space. Annanolli’s painting style is very material driven. Key issues in his artworks are surface structure and the use of recycled fabrics, such as cast-off tablecloths, bedspreads and curtains. Recycled fabrics are used as a base material for paintings, and the artist also combines fabrics with sheet metals in a surprising way. Annanolli’s painting techniques include acryl, oil colour, egg tempera, ink and carbon. The artist has been fascinated by many features of colour ink painting; in particular, its transparency and the power of colour. Another of Annatolli’s innovative techniques is the use of a barbeque stick as a stylus for producing a haphazard drawing line.